We have our next guest post here! 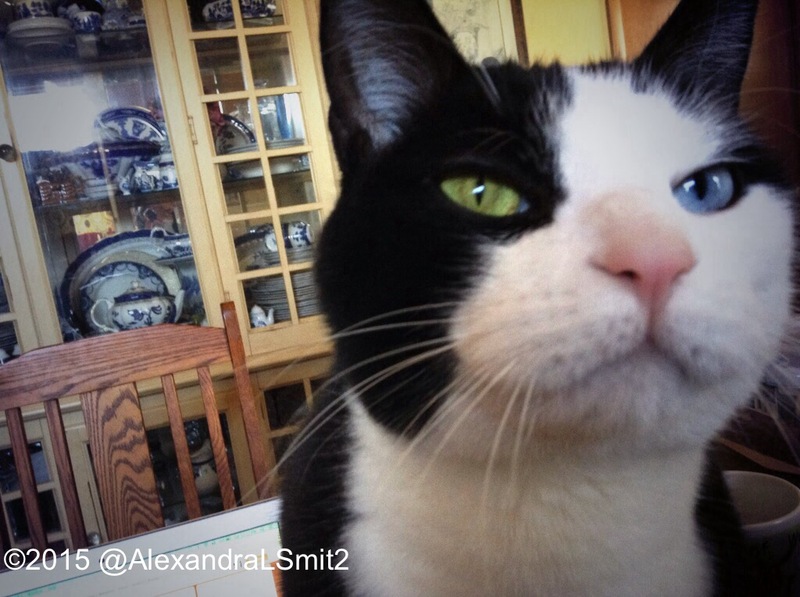 Alex did a long (email) interview (and some chat) the the staff of our old twitter friend MightyMolasses. 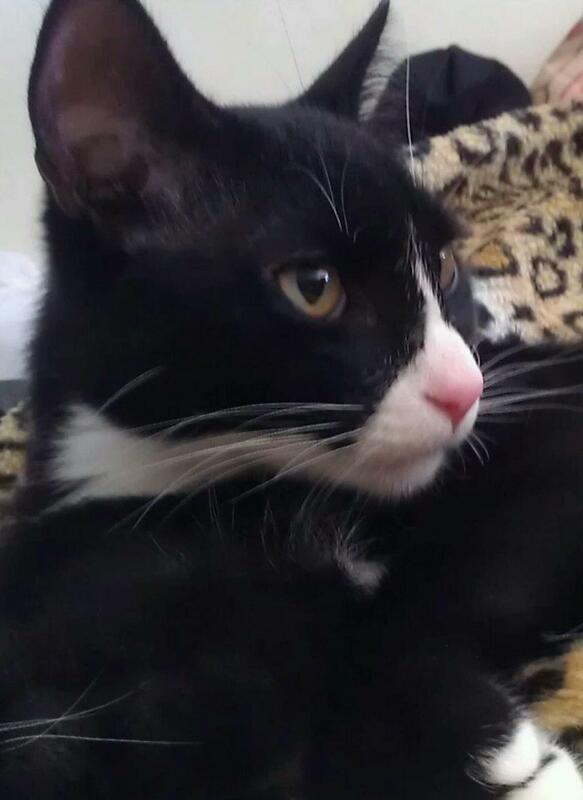 MightyMo, the handsome tuxie who graces the pages of Twitter along with so many others, has a story that brought him unexpectedly home with a volunteer at his shelter. Wait … unexpectedly? Let’s be honest — MightyMo worked his magic on his now-human who only wanted contact with animals, not necessarily to have one of her own again. But Mo won that battle! 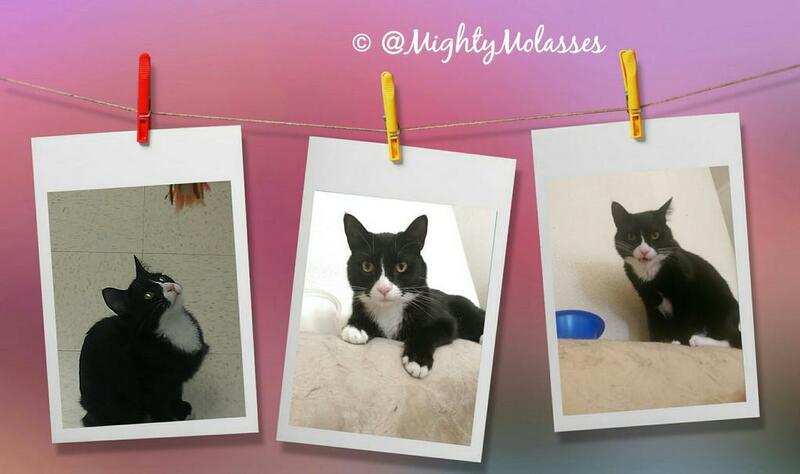 The story begins in July, 2013 when MightyMo’s human Jo began volunteering as a cat socializer at the Humane Society of Silicon Valley (HSSV) in California. While volunteers are discouraged from adopting right away, she was quickly smitten with siblings Marbles and Molasses. Marbles was a black cat with a thin streak of white down her belly, and Molasses (later shortened to Mo) was a tuxedo cat. They were three months old then. Jo hoped they would be adopted together, but Marbles went to a home as a companion animal for a miniature French poodle. It was sad to see Molasses alone, but apparently it didn’t bother him much at all. Mo was placed with two other kittens, one of which became ill, so all three were taken out of the adoption section and into the Pet Hospital to make sure they wouldn’t all become sick. It all worked out fine in the end, but while he was isolated with the others, Jo kept thinking of Molasses. She visited occasionally to see how they were doing. “Happily, none of them developed any serious illness, and eventually they were once again made available for adoption,” she said. By this time it was well into fall, and she’d known Mo now for four months. Thinking it over, Jo came to a decision. “He uses me as a launching/landing pad when jumping from the headboard to the other end of the bed. He likes to sit as close to my face as possible. He combines the two if he wants me awake immediately,” she adds. 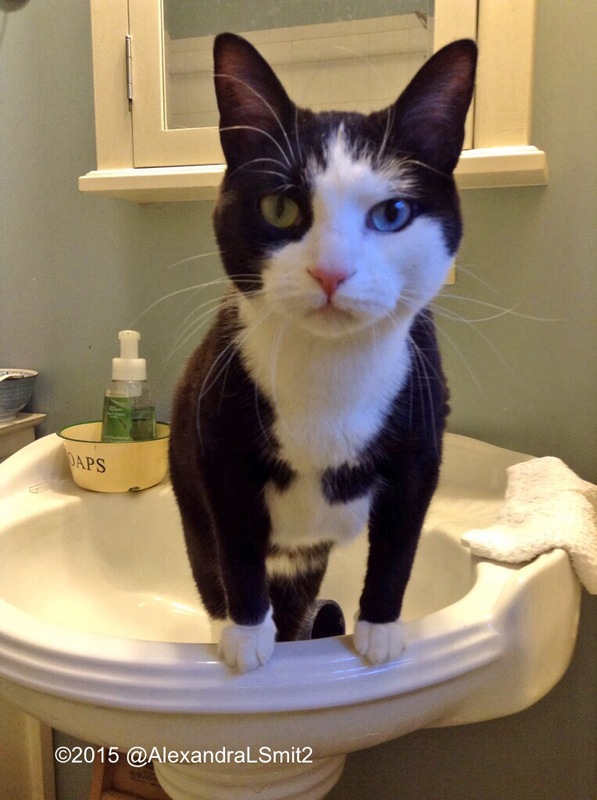 “One of his favorite tricks at the moment is knocking his water bowl over and getting me as wet as possible.” Tuxedo cats do have their personality quirks, don’t they? But we love them all the more because of it. Jo’s favourite things about Mo are his purr and willingness to cuddle. “He makes bread pretty readily. He can also entertain himself. He taught himself to fetch..it’s a favorite game of his,” said Jo. He keeps his toys under my dresser and I can hear his nails on the bedroom floor as he bats various toys out from under the furniture.” That’s not always an enjoyable time, she added. The name “MightyMo” conjures up an image of a superpower cat. How he got his name is much simpler and heart-warming, though. 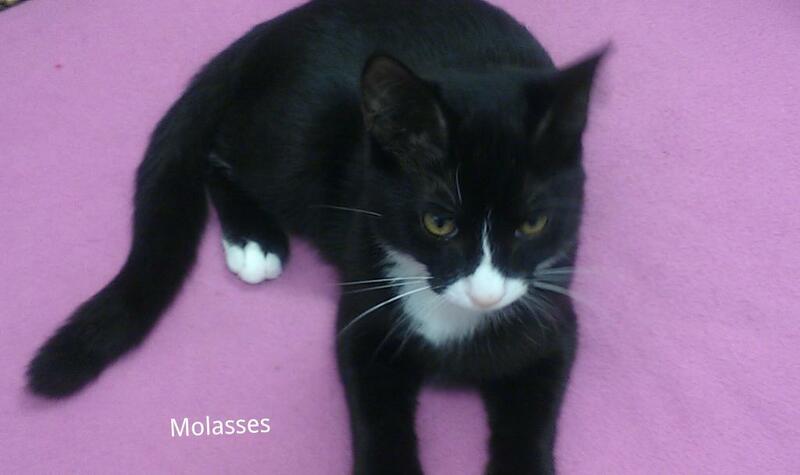 “The shelter named him Molasses. I shortened it to Mo. ‘Mighty’ got added when he started tweeting.” Jo said. “In creating a Twitter name for him, I kept thinking about a childhood cartoon character, Mighty Mouse. Mo sleeps anywhere he pleases. “I think he spends most of the night in the living room. He has a bed with me and he does spend at least part of the night with me. He also serves as an alarm clock. Feed me!” laughed Jo. Like so many adoption stories, Mo’s was a combination of someone not intending to adopt, a cat wrapping its paws around their heart anyway, and getting his own way (in the form of the human he picked out) in the end. I have to say a big thank you to Alex for the Interview work. She is a real good helper (assistant) here with the blog. Next blogpost will be a #HugiMeows with some words about the blogging experience , a FAQ and some ideas for the future. In a previous blogpost we talked about #Unfug, but this Guest blogpost from Alex is hilarious. In previous guest blogs, I’ve talked about George’s rescue, his adoption by my father, and how he came to live with me. This post will talk about how George breaks things. Like, constantly. 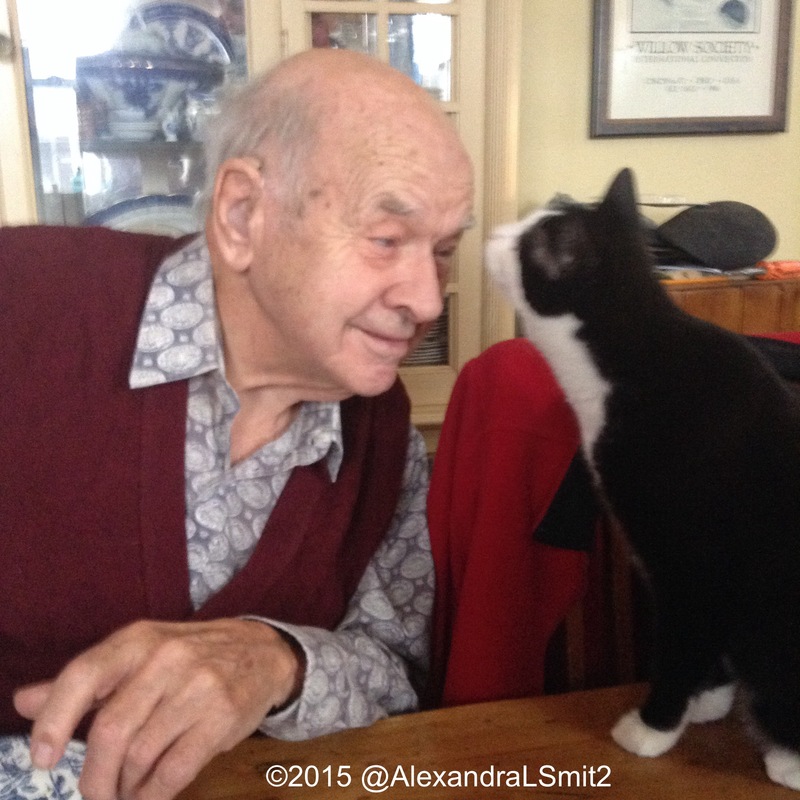 George had a five-week transition from living with my dad to living with Molly and me. Dad stayed so George would think by the end that he was already “home.” That strategy worked. The very first day he lived here, my dad and I were sitting in the living room and I heard a crash from the kitchen. 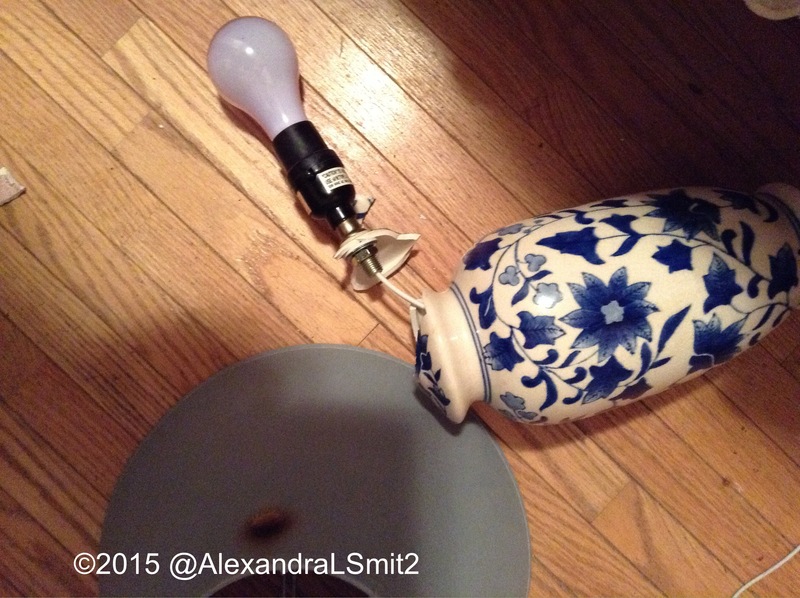 I hurried in and found my coffee mug had been knocked to the floor and shattered. 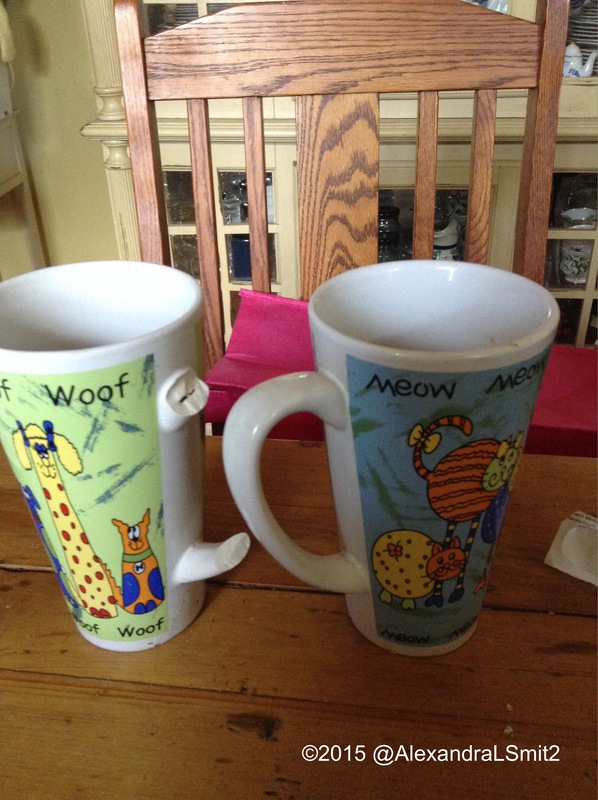 It did not escape me that the saying on the mug was “When I Die The Dog Gets Everything.” Back then I wasn’t used to taking pictures of his damage so I can’t prove it but I recently posted a photo of two mugs: one said Meow and the newly-broken one said Woof. They were exactly the same size and shape. What that showed me with the first mug he broke and that one is that not only is George destructive, he can read as well. (MOL). 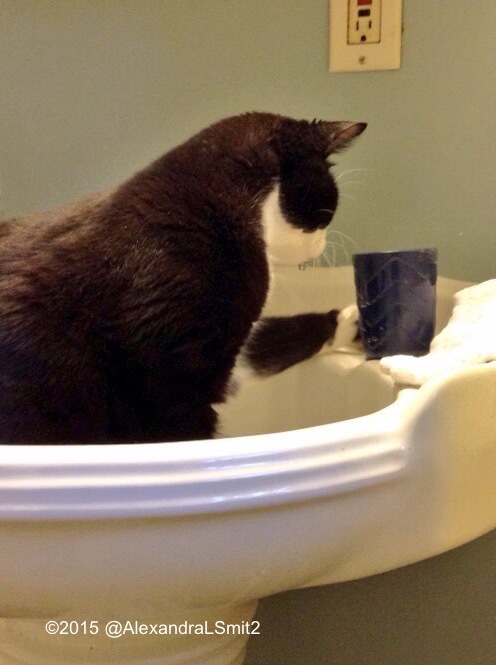 Later that day, he knocked a glass to the floor from beside the sink. “I told you not to leave anything out where he can get it,” said Dad. “No you didn’t tell me that,” I replied. “Well, don’t leave anything around where he can get it.” Hmmm, Dad, what are you keeping from me? Not many weeks later, I called Dad to tell him George had broken the lamp in his room here. “What on earth? He never did that sort of thing when I had him.” I called BS on dad, because in the same period of time, I’d lost pretty much every drinking glass and a couple of small vases. “He didn’t just START breaking things when he came here!” I said. “Well, I don’t know what he’s doing,” Dad lied. Here’s George’s tally as of June 6 (yes, I am aware that’s also the anniversary of D-Day). 1. One laptop. He jumped at me from behind, his feet landing on the oversized monitor. It snapped back and broke the power socket. It’s still not fixed. 2. Four lamps. 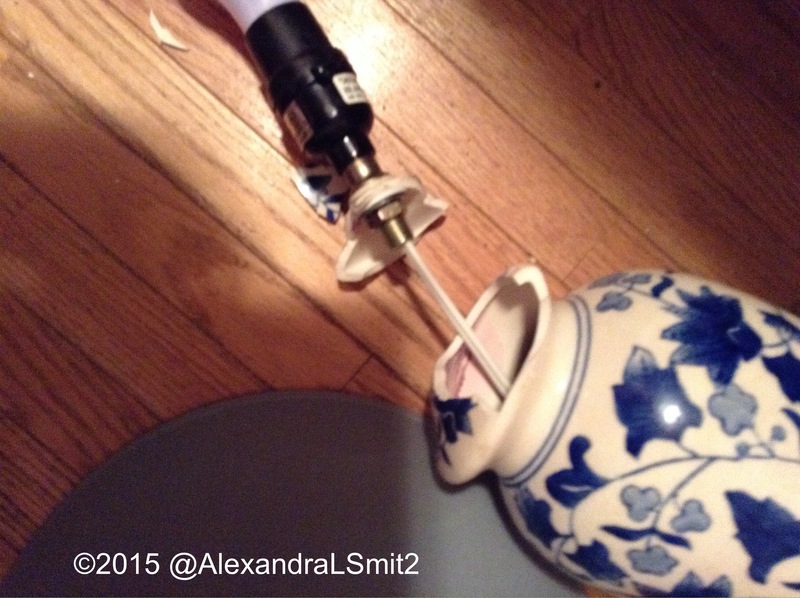 On the second lamp-busting I was able to photograph it while it was happening. Or, at least, the planning session. Yes, George strategizes. He looks something over, up and down, side to side, and goes away and thinks about it. Because I was there, he waited until the next day to break it. For confirmation of this, ask @Smiglilley, to whom I sent the photos as I took them. The next lamp was the replacement lamp in my dad’s room. The third was in my bedroom, and it’s still not working. The first was a small decorative lamp WAY UP HIGH. 3. One tablet, and three glass screens on tablets. He accomplishes this by coming out of nowhere while I’m sitting with the tablet, and head-bumping it from my hand onto the hardwood floors. My whole house except the bathroom is hardwood. The bathroom is ceramic, so don’t suggest I only use the tablet in there. When he broke the first tablet and I replaced it, I got the insurance that gives me two free glass screen replacements. It needs it already but I also got the screen protector so at least glass chips aren’t cutting my finger tips. I will wait until November (2-year warranty) if I can, then the following October for the second replacement screen, because yes, it will happen again. 4. Unless it’s behind cabinet doors, George has broken all of my glassware and a few mugs. The glassware has been replaced by plastic. I got pictures of him trying to break the tumbler at the bathroom sink, knocking it down, realizing it didn’t break, and whirling on me to confront my unmitigated fall to exchanging it with plastic. 5. Two cat food bowls and one dog food bowl. I feed George higher up so the dog doesn’t eat his food, due to George grazing on his kibble all day long. 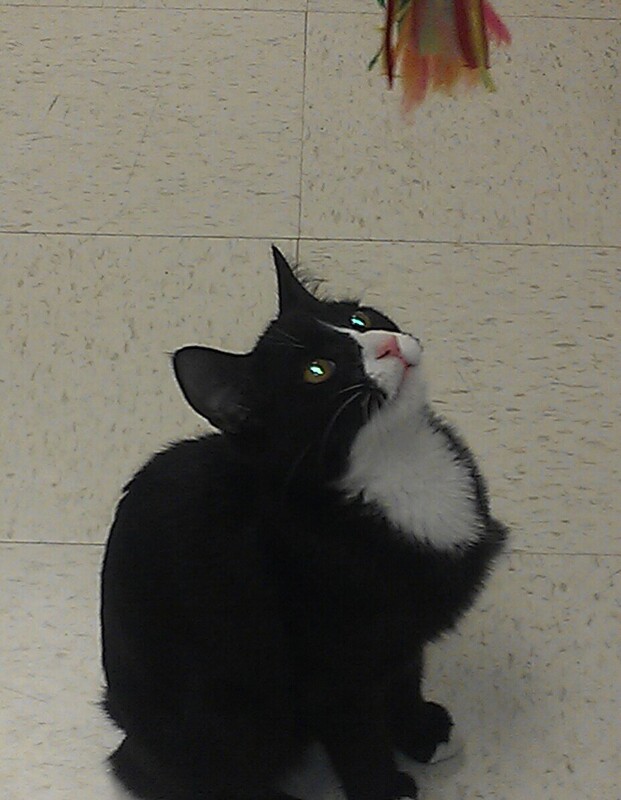 One day I heard a crash, and came out to find he’d knocked his food dish off the counter. I replaced it with a very heavy ceramic one I thought he couldn’t wreck. The crash of THAT kibble bowl made it land on the dog’s bowl below, and both were shattered. 6. Various and sundry toiletries in the bathroom somehow end up out of my great-grandmother’s coal scuttle or a toiletries bowl I have, knocked onto the floor. 7. Molly’s bottle of Cod Liver Oil capsules. She gets two capsules a day to keep her skin and fur smooth because she has normally dry skin. It was a PLASTIC bottle. He knocked it off the table and the plastic lid snapped off, spilling fish oil capsules everywhere, By the time I’d picked them up, Molly had eaten maybe 1/2 of a new bottle of 100. My house was NOT a pleasant smelling place for two days afterwards. Have you ever smelled fish oil farts from a dog? I’ll leave it at that, but you get the picture. His absolute greatest joy is breaking things. The noisier the better and he sits waiting for me to come see his handiwork. While the greatest expenses have been lamps and electronics, George doesn’t care what it costs. If a $1 glass makes as much noise as a $200 tablet, he’s happy. I am sure that George is “acting out.” I am also sure he broke things at my dad’s place even though dad won’t admit it. This didn’t just start here. I suspect this may have something to do with George’s front claws being removed at his abusive previous home setting. So if he can’t shred any longer, he can at least maneuver and knock things over, and make things crash. I’d love some feedback on why you think George does such things, and whether I’ll ever be able to drink from a goblet made of glass again. UPDATE: The day before I wrote this post, George had tipped a lampshade to where it rested on the lightbulb, and it burned a hole. I guess the lamp was ruined for him then, because last night, June 11, he added that lamp to his score card and it landed on the floor, shattering. Well that was George ..
(copyright all pics in this blogpost by Alex, all pics used with her permission here, please respect this! Here we go .. the second guest post about George! This post is about George coming to live with me after Dad had to move to a place that had allergies and he couldn’t take George along. It’s also a story of transition that was absolutely the least heartbreaking surrendering of a pet when there’s no other choice. 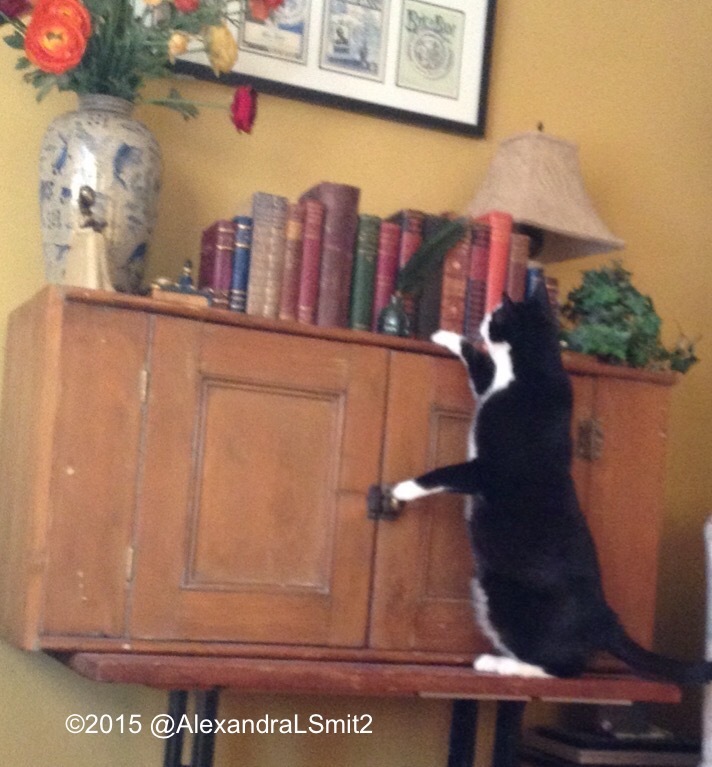 That had to do with my dad’s concern for this tuxie who’d stolen his heart. To summarize from before, George was one of 90 cats rescued in a two-county seizure for neglect and cruelty. He nearly died; many of them did. But he beat the medical odds against him and recovered to the point where he could be placed for adoption. He was estimated to be 1.5 to 2 years old at time of adoption, based on his teeth. So based on taking the top end of that age estimate, he will be four years old in October, 2015. But he might only be 3.5; I took the upper estimate. Dad and George’s first reunion after dad moved away. They have a very special bond. My dad originally adopted him because Dad was sad and lonely. My mum had recently passed away and he also couldn’t forget the little calico kitten he’d rescued up north. 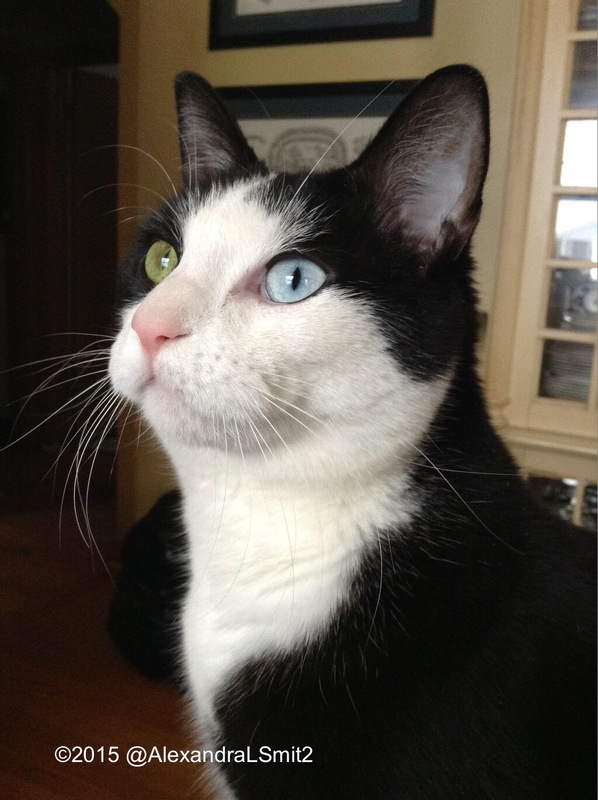 Adopting a cat was constantly on his mind and while he saw a few calicos the day George was adopted, his heart went to the tuxie with one green and one blue eye (although strangely, I was the only one who noticed that at first). It was really George putting a spell on my dad so he come into our family. So, things went really well. George and my dad were fast friends. When dad said it was bedtime, he’d head to the bathroom and come out to find George always sitting at the end of his bed. While my dad lived relatively close to my older sister and I (20-25 km) we couldn’t always be there. I invited him to move in here, as my folks had done for my grandmother, and he was thinking it over. He was 86 then, and while spry and alert, he had a few issues. Like, he couldn’t cook. Washing machine? What’s that? “What about George?” he asked. “What about him?” I asked in reply. I reminded him of the promise he had had extracted at the time of his adoption. ‘If anything happens to me, one of you will take George, right?” I told him of course George would be cared for. “What about Molly?” She’ll love him the minute she sees him, dad. My younger sister, who is a 6-hour round trip away by car came to see dad one day and before we knew it, the flat was up for sale, she and her husband had started renovations on a suite for him that included his own bathroom, lounge and sitting areas. He was excited to spend more time with his youngest daughter and grandson, whom he rarely saw because of the distance. Within a week, the flat sold and dad was moved in here, complete with George, and his plan was to stay five weeks to “transition George.” George couldn’t go with my dad because my nephew is allergic to cats. I prepared a room for him, and the move happened. George didn’t need five weeks. More like five days. The first day he arrived, he met Molly. 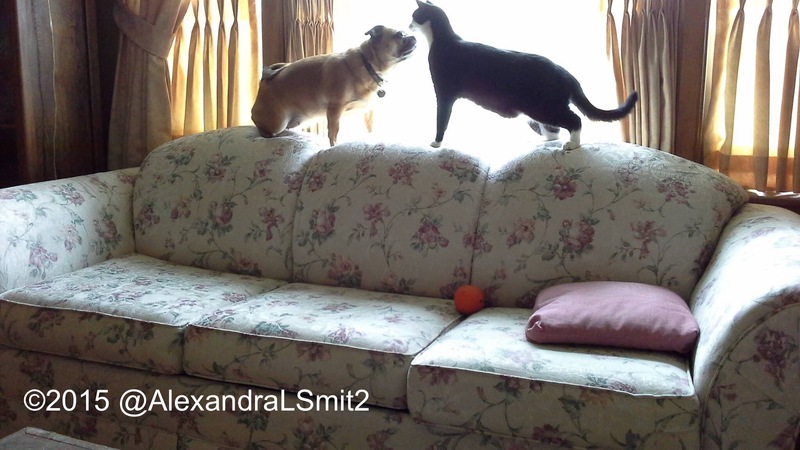 They ran into the living room, jumped up on the couch, and stared at each other. Molly tried to sniff him and George lifted his left paw and smacked her one. Then it was done. He was boss of the house, he was in his new home, he had a minion and a plaything and his papa was still around too. I kept Molly in my room with the door closed at night so a) George and Dad could have their together time and b) so George could have the run of the house to explore his new home without interference from his pesky new sister, who was forever following him around and bringing him yucky dog toys covered in slobber. (This gesture on my part would later prove quite costly, but that’s another story.) George would just lift his paw, give her a soft smack and she’d go lie down somewhere. Poor Molly. George meets Molly, who is excited to meet him. He smacks her and that was it, he’s boss. Finally, moving day came. Things had been taken a few at a time to my sister’s so it was just a case of his duffle bag and a few personal possessions left here. He fit those all into his car and he headed down the road to the new life chapter in his life, but without his bosom buddy George. The next day, dad phoned and asked me to put Molly and George on the phone, George first. He talked to them, said “I’ll be back” and he did that increasingly less. Every second day, every third day, then once a week. He didn’t want them to be upset he was gone. George’s natural curiosity takes over and he’s into everything. I believe the long transition dad set up (which benefitted him more than George but awwww) and the fact that George met me the same time as he met dad, and saw me every time I went to visit dad when he still had the flat, contributed to his successful transition. He already knew me, he now has his minion, and he knows dad comes back. But he’s my cat now. Don’t let my dad tell you anything different. He’s delusional. MOL (just kidding). And yes, when he phones, he still asks me to put George on the phone first, then Molly. 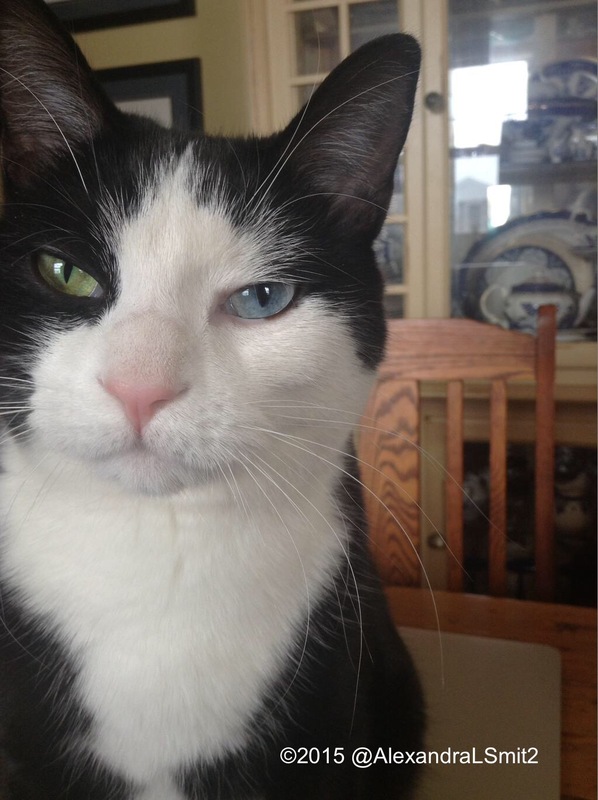 NEXT BLOG POST will be on heterchromia iridium, the genetic condition that gives humans and animals different coloured eyes. After that, I’ll do one on George’s reason for lifelong #unfug membership. He breaks things. Regularly, noisily, and with great joy. by our twitta friend Alex ! 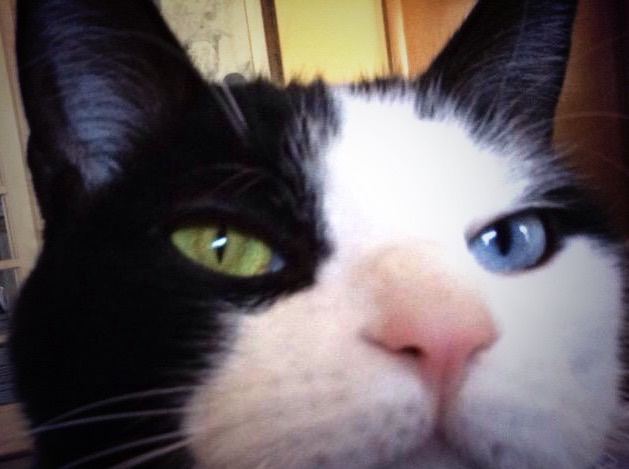 This post is about George, the amazing tuxedo cat who has beaten so many odds against him. 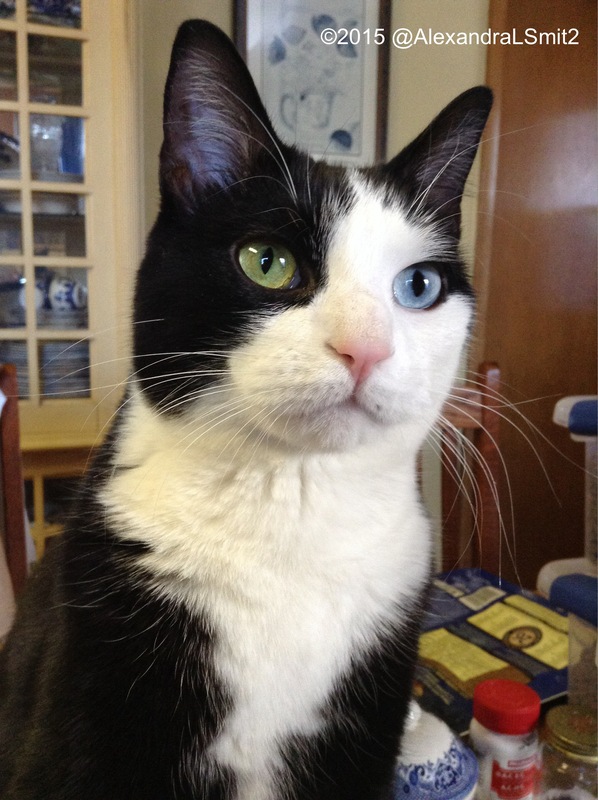 George, who is about 3.5 years old now, was part of a 90-cat rescue in late winter of 2013. Two local Humane Societies joined forces when they heard of the problem in a town nearby. Mine was one of them. The Humane Society in whose jurisdiction the rescue occurred took 60 cats, and mine took 30. How fortunate for us that George came here! George was a very sick cat when he was rescued. He was immediately hospitalized by one of the clinics affiliated with the local Humane Society. He was full of infections, worms, and dehydrated. He spent a month on IV drip as he recuperated. While I don’t have the exact number, many of the cats rescued at the same time did not survive. George has a fighting spirit though and he made it. It might be because of his relative youth, no one is sure. The rescue took place on a rural property, where no one would have noticed the number of cats or their condition. I’m not sure who called in the authorities; possibly the postman or a family member. According to George’s rescuers, he was one of about 10 “favourites” kept in the house by the elderly owners. He had been declawed on his front paws (grrrr) and I like to think it’s because he must have shredded up their draperies and furniture first. 1. The couple was elderly and needed to go into care (that did happen). 3. George and the other cats who were “favourites” in the house were still neglected medically, as were all the ones outside in the barn and on the property. Hence, the infections and worms; even the dehydration. I hope with everything in me that his front paws’ declawing was not DIY. 4. As the numbers of cats increased, the well-being of the elderly couple on that rural property was declining simultaneously. It was a disaster waiting to happen. And it did. In the overall muddle of too many cats, declining mental and physical health of the elderly couple, the deaths of unknown cats, George emerged at one of my local shelters. My dad was looking for an adult Calico Cat. He had his heart set on a calico. He’d rescued a calico kitten up north the year before and he missed that connection. One day, he called my sister and I and said “I’m ready.” Our mum had died not long before and they always had cats. He kept thinking of that calico kitten. So my dad, my sister and I went on a calico hunt at the local Humane Society and local shelters. At the Humane Society he held and cuddled every calico there. Something said “no” to him, he said later, so we went off to the first shelter. Another calico, another cuddle. No, said dad. 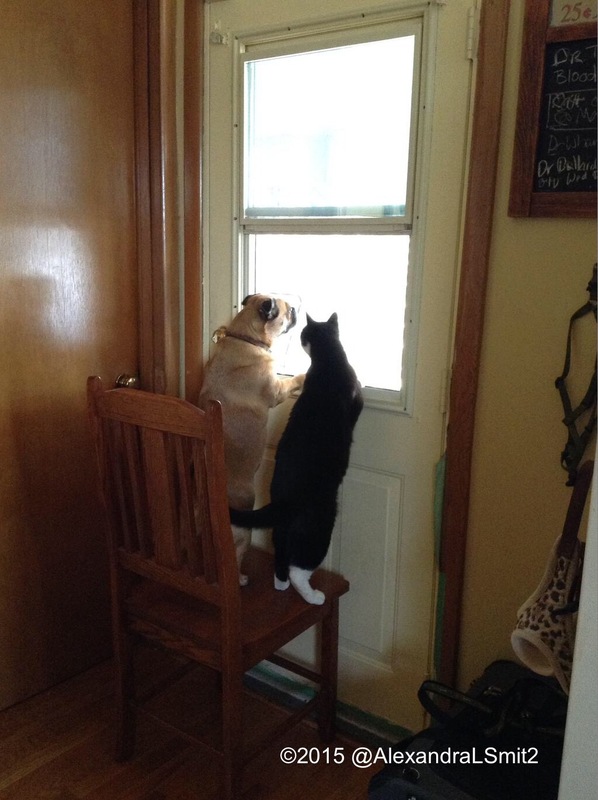 We were starting to think maybe he felt he was wrong to get a cat after all. As we headed back here, I remembered a small shelter tucked away in a plaza. I said, “Let’s try there, and if dad doesn’t find one, we’ll call it a day.” So off we went to the third shelter. None of us even noticed George at first. Our eyes scanned the cages for calicos. We went into small lounge, where the shelter staff brought us the two calicos they had at the time. One was friendly and loving; the other was frightened. Dad held them both, cooed to them, asked the staff to leave us for a bit. Dad told my sister and I “these are beautiful. I don’t know why I am hesitating.” We told him he probably was not ready yet, and we’d try again in a month. The staff came back in. 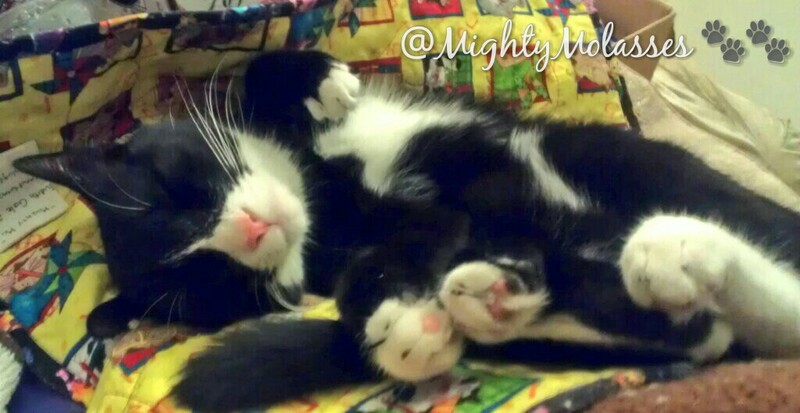 One of the staff said, do you like Tuxies? 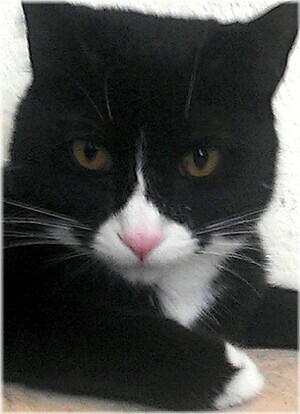 We have a beautiful tuxie who just became ready for adoption. He was sick for a long time and she told us the general details of his stories. Dad said no, but I said yes, please! My last cat (18 years old at OTRB time) was a tuxie. For me, there’s something about Tuxies. In came George, looking serene and all-knowing. It was love at first sight. He wouldn’t be ready for another week, they said. They wanted to retest his blood & stool one last time. 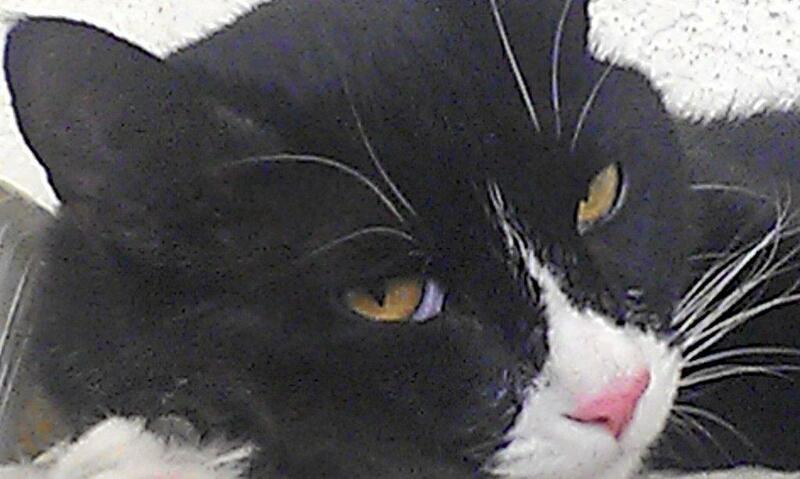 Dad went out and bought a litter box, kibble, treats & toys. I dusted off my pet carrier. A week later, George was his. NEXT BLOG POSTS: I will do future posts on George’s #unfug personality, and how he came to be with me instead of my dad (who remains heartbroken he couldn’t keep George. Let’s leave it at allergies for now).